How to Eyedropper a Platinum Preppy Fountain Pen! The Platinum Preppy resides near the top of the list for the best starter pens. It comes with Platinum’s Slip ‘N’ Seal Mechanism, which allows it to last up to a year without use while capped. For $4 USD it’s nearly impossible to beat the price. 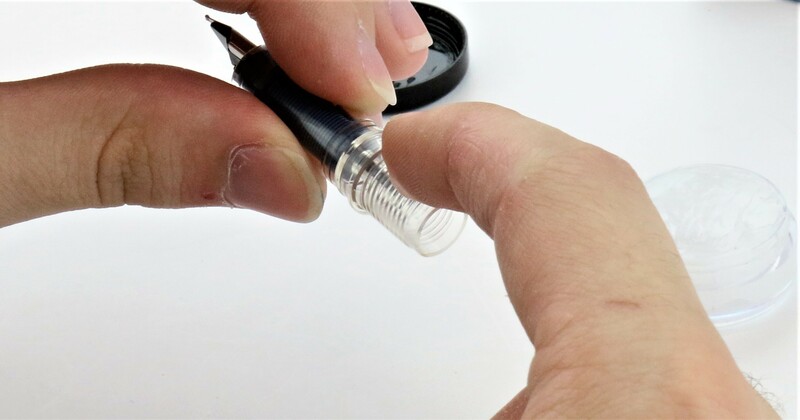 You can even convert it to an eyedropper, which gives it a massive ink capacity. Today, we’re going to focus on how to eyedropper a Platinum Preppy Fountain Pen! An eyedropper conversion can be a little scary and a little messy without a little guidance, but that’s what we’re here for. There are a few words of caution we’d like to put out there before getting on with the guide. Eyedropper pens can have issues with burping due to large changes in pressure and temperature. Also, eyedropper pens are not suggested for flying, unless they have o-rings and shut-off valves like the Opus 88 Fountain Pens. The first thing you will want to do is gather your supplies. You will need the following: 1 Platinum Preppy Fountain Pen, 1 Pen Chalet 10ml Ink Syringe, 1 Pen Chalet Silicone Grease, and 1 Bottle of Ink. Once your supplies are together, you will want to remove the grip section from the barrel. Next, take a generous dab of Pen Chalet Silicone Grease and spread the grease along the threading. Make sure to cover all of the threading in grease. as the grease creates the leak-proof seal. You may want to screw the barrel back on and then off again in order to make sure the grease gets into the threads. 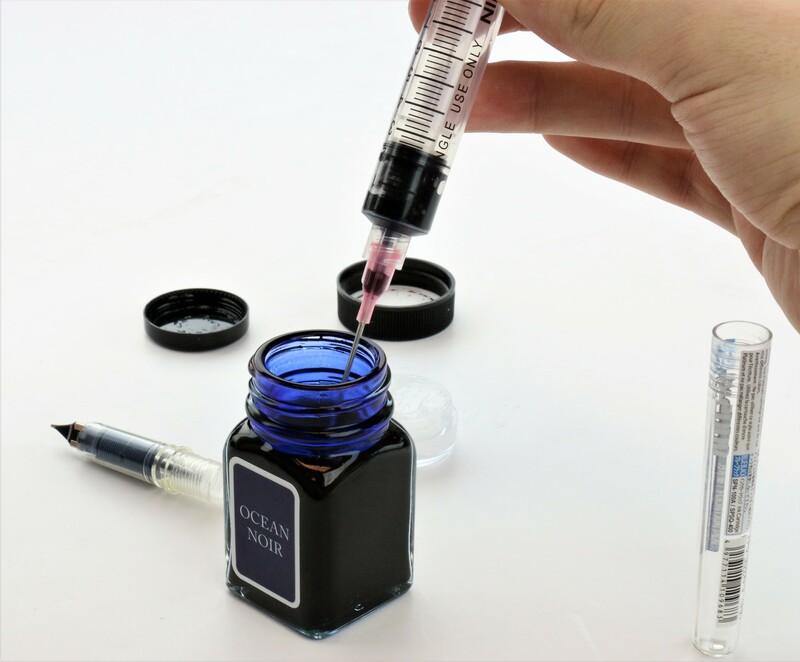 Next, take your Pen Chalet 10ml Ink Syringe and fill it with approximately 3ml of ink. 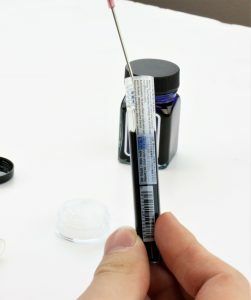 An eyedropper-ed Platinum Preppy can easily hold 3ml of ink. Carefully hold the barrel in one hand, and with the other, syringe the ink directly in. You will want to make sure to keep the barrel open-end up through the entire process. Once the barrel is filled with ink, carefully screw the grip section back onto the barrel. The Silicone Grease that we applied earlier will seal the threads, and keep any ink from leaking out. If, for some reason, and ink starts to leak out, simply apply a little more silicone grease to the threads. Now, you’re ready to write! Make sure to enter the giveaway below to win a Platinum Preppy Eyedropper Kit! Also, let us know in the comments below what “How To” guide you’d like us to do next! Remember, We have the Write tools for the Analog Writer! Enter To Win a Platinum Preppy Fountain Pen Eyedropper Kit! 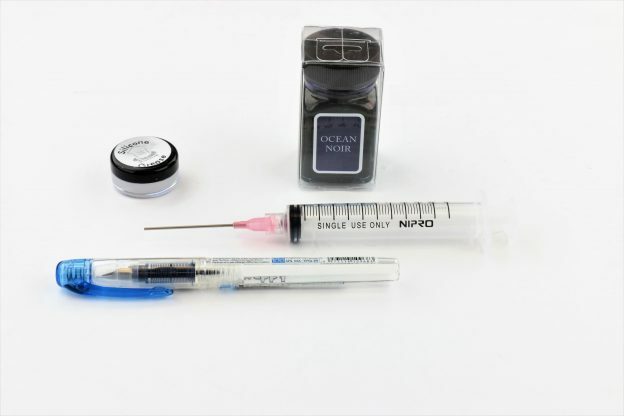 Enter to win a Platinum Preppy Fountain Pen Eyedropper Kit! Kit Includes: 1 Blue M Platinum Preppy Fountain Pen, 1 Pen Chalet 10ml Ink Syringe, 1 Pen Chalet Silicone Grease, and 1 30ml Bottle of Monteverde Ocean Noir Ink. This entry was posted in Fountain Pens, Instructional and tagged fountain pen, fountain pen ink, How To, Platinum on August 10, 2018 by Pen Chalet. I have several preppys that I’ve eyedroppered, but they all have o-rings. I’ve never considered trying it without an o-ring before now. I guess it’s worth a try. Maybe I’ll test it out with some water soluble ink or maybe just water. I really want to try converting my Preppy into an eye-dropper so that I can use whatever ink I like. This article is really helpful. Thanks. I’d love to see a review of the best pocket pens! Platinum Preppy one of the best………………………… in the world. I’ve always use o-rings and silicone, don’t know if I would feel safe with only one barrier. I would like a guide on repairing piston filler pens that don’t fill. Some folks also recommend using PTFE tape instead of silicone grease (not nearly as messy, and gets a good seal). I would love to try the eye dropper! I’ve been wanting to try out a preppy. Ok well that makes it sound not so scary… thanks for a step by step.